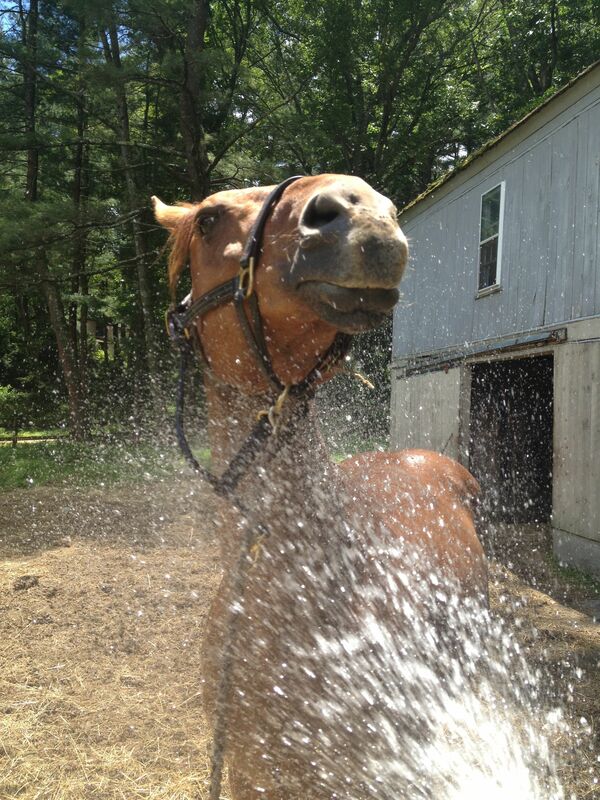 Freedom enjoys getting hosed down — and then he retreats into the barn to stay cool. I am not complaining. After last winter, I swore that I would not be one of those people who start to moan about the heat and humidity. In February, I was dreaming about being hot again. And in that dream I was happy. This week we’ve had temperatures in the 80s. It felt like we went straight into summer. Much of it was very, very pleasant. It made me long to spend the day on the beach and I indulged in some afternoons at the pond, catching up with my work in my “summer office” in an Adirondack chair. For the horses, it’s felt hot. Freedom spends most of the days standing inside the barn, which is cool and bug-free. All winter he stands outside (by choice) while the wind, rain and snow beat down. As soon as it’s hot? He can’t wait to go in. This is the season where I go through shavings by the bagful. These are the days when I’m glad that the horses can stay out all night. I know they are enjoying those cool evenings hanging out and then sleeping like teenagers late into the mornings.